Most veteran lab technicians and metrology specialists know that consistent pipette calibration allows for greater quality results and saves money on reagents. They realize that being off, even by a slight margin, can create a significant error in lab research. The average pipette typically requires calibration service at least once a year and most biotech companies do semiannual calibration. It is strongly recommended and in many cases required that each pipette be serviced by an ISO 17025:2005 accredited laboratory. ISO 17025:2005 accreditation complies with the International Organization for Standardization (ISO) criteria. ISO 17025:2005 “specifies the general requirements for the competence to carry our tests and/or calibrations, including sampling. 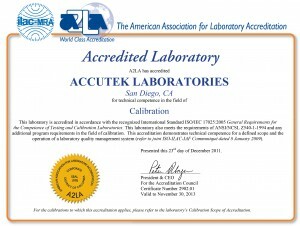 It covers testing and calibration performed using standards methods, non-standard methods, and accredited laboratory-developed methods.” Proper pipette calibration is not a hurried process, instead it is a full-service system that complies to strict and precise practices in a controlled environment to attain an accurate and dependable scientific instrument. Proper pipette calibration is not a hurried process, instead it is a full-service system that complies to strict and precise practices in a controlled environment to attain an accurate and dependable scientific instrument. Ultra Micro Balance. The required balance for verification and calibration of micropipettes (under 100uL). and Technology (NIST) standard, NIST is the “federal technology agency that works with industry to develop and apply technology, measurements, and standards.” The difference between an onsite and off-site calibration service center, is the quality and extent of experience calibrating pipettes, as well as sensitivity and accuracy of equipment used to perform calibration. Typically, onsite service doesn’t work under the proper environment to conduct consistent and sustainable testing. However, off-site calibration service does as they work under a controlled temperature facility which ensures all ISO protocol is followed when calibrating. Moreover, off-site calibration services have the appropriate equipment to calibrate every pipette size and volume, including ultra microbalances. Standard 4 Place Analytical Balance. Do not use for verification or calibration of micropipettes (less than 100uL). An ultra microbalance is needed for the 2μl to 50μl micropipettes because it reduces the margin of error. Ultra microbalances display a more accurate volume the pipette dispensed by showing the microgram volume. 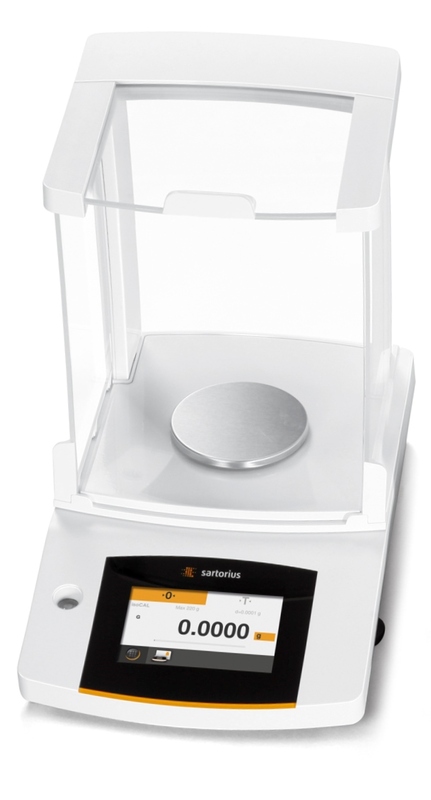 An analytical balance will display a volume of 2μl by only displaying the milligram volume. For example, an Eppendorf Research® plus pipette at the volume of 2μl at minimum needs a balance that show 7 decimals. Thus, if your balance is not a 7 place balance you will never see the true accuracy of your calibration on micropipettes. Thus, if your balance is not a 7 place balance you will never see the true accuracy of your calibration on micropipettes. 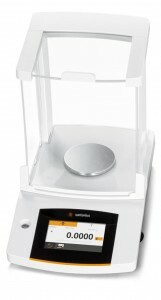 Balance manufacturers and distributers do not recommend and in some instances do not sell analytical balances for calibration of 50μl pipette volume or less. An ultra microbalance, which can calibrate up to 7 decimal places, must be used when calibrating micropipettes. However, most onsite calibration services use analytical balances for all of the pipettes calibrations, which is not capable of precisely calibrating micropipettes. Additionally, onsite services either carry these balances from lab to lab or use the customer’s balance (which may not be calibrated depending on protocol). Both of these methods may cause inaccurate results because the balance may be out of calibration. Off-site calibration facilities, such as Pipette.com, have the correct balances and their balances are checked for calibration verification on a weekly basis and calibrated to NIST standards once a year. This ensures that Pipette.com is able to provide the most accurate and precise calibration results for all models and sizes of pipettes. In addition, Pipette.com’s balances are synced to a software that will automatically upload the data, whereas on-site calibration manually inputs information adding to the possibility of human error and possible fraudulent misrepresentation of information. Off-site calibration facilities, such as Pipette.com, have the correct balances and their balances are checked for calibration verification on a weekly basis and calibrated to NIST standards once a year. Furthermore, when searching for a potential calibration service, one of the criteria’s should be whether the calibration service laboratory has spare parts in order to perform Preventative Maintenance (PM), the process of proactively replacing parts that are known to wear before they affect the performance of the pipette. This process is important as regular PM keeps pipettes within specification and prevents data errors. 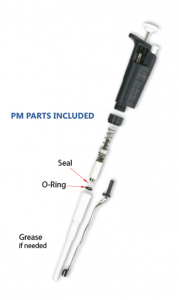 Pipette.com works with PM methods and is also factory trained for pipette calibration. They also stock spare parts in its inventory to guarantee immediate repair. Pipette.com stores all pipette data and reports in their easy-to-access online Total Pipette Management™, complimentary to Pipette.com customers, to ensure precise and quality care of your pipette. Each of these components contribute to accurate measures the pipettes accuracy and calculates its liquid handling capacity to better make adjustments that will improve the scientific instrument. A calibration service laboratory will utilize this equipment to make changes and remedy errors made by the pipette. Pipette calibration is necessary to prevent inaccuracies in order to attain better results, performance, and longevity of the pipette itself. Pipette.com offers premium service at an affordable price. One of the key benefits of having your pipette serviced by professionals like Pipette.com, is that you may track and access the performance of your instruments over time through online TMP, which is FREE to Pipette.com customers. You may also perform field checks on equipment and the calibration comes with a warranty – 90 day warranty on calibration and 1 year warranty on parts. 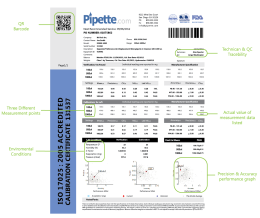 Each pipette comes with data supplied on an accredited calibration report. You may also choose to pay an extra fee to receive a GMP/GLP Certificate. The benefits of off-site pipette calibration are numerous, get your pipettes serviced by Pipette.com and experience the difference in your results. 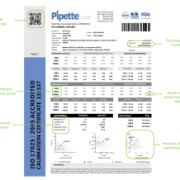 Take advantage of Pipette.com’s 10% discount for new customers and schedule your calibration service today or download the calibration form and contact Pipette.com for a shipping label. If you would like more information about pipette calibration, call 1-800-243-3232 or email info@accuteklab.com, they would be more than happy to help.